Many bands need to take a breather, to re-analyse and take stock of their position on this landscape. It’s what Pelican have done since October 2009’s What We All Come To Need. The band, once road hogs, didn’t tour a whole lot after it as the realistic woes of it all came crashing in and while the band finally resurfaced in early 2012 with a brief EP entitled Ataraxia/Taraxis, it was clear that Pelican was in a state of flux. This change would come in the form of a departure, that of long time guitarist Laurent Schroeder-Lebec. While Ataraxia/Taraxis was by no means a dud, it was clear that the band needed to re-evaluate. With fellow Chicagoan and guitarist in The Swan King, Dallas Thomas coming into the fold on a permanent basis and much time to plot and plan this new album, Forever Becoming, Pelican have made it clear that they intend on beginning a new chapter in their decade-plus tale. Forever Becoming sees a new verve blossoming for the band and while they haven’t necessarily smashed down the established boundaries around their sound, there’s a rich invigoration here, the kind we haven’t quite heard since The Fire in Our Throats Will Beckon the Thaw. Deftly crafted and with more attention than ever put on layering a song, Forever Becoming sees the band working at their most versatile, shifting between the brooding trudge of their earliest work and the ebullient almost light-hearted spring of City of Echoes, all the while maintaining a distinctly Pelican heaviness. ‘Deny The Absolute’ shows them at their most raucous with an atypically short song, when compared with most in their back catalogue. The manic sludgy tone in the guitars has been tightly and forcefully packed into this track while ‘Immutable Dusk’ exhibits the band’s nimble skills of push-and-pull. First, slow meandering but crunchy guitars rule the order before descending into a lush, almost lullaby, mid-way passage characterised by an eerie bass undertone and glistening clean guitars. This mood is, predictably but still impressively, disrupted by a boisterously heavy crescendo to close. While always heavy, the band will equally maintain an affinity for melody and ‘Vestiges’ is more than proof of that with vibrant lead riffs to slowly bloom into beautifully ebullient verses and makes for a record highlight. 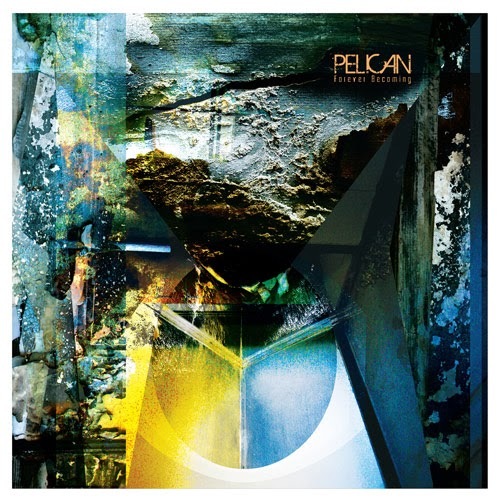 ‘Perpetual Dawn’ brings us back to a time when Pelican were able to whip up a maelstrom of a closer, like ‘Sirius’, and that’s exactly what this particular track does with fiery riffs and a juddering crescendo followed by a hymn-like passage to trail us off into tranquil climes to end Forever Becoming. Revitalised is perhaps the one key word when talking about Forever Becoming. The break has served them well and if this is the next chapter in their tale then the plot may only be getting better. what is up with Pelican’s new release entitled Arktika. not only that but I can’t find Forever Becoming on their discography. such discrepancies bother my OCD.